This author is not the world’s biggest xkcd fan, but this is one of my favourites. I don’t own quite the amount of gaming equipment here, but I completely understand the mindset. Click the image to go to the original xkcd post. 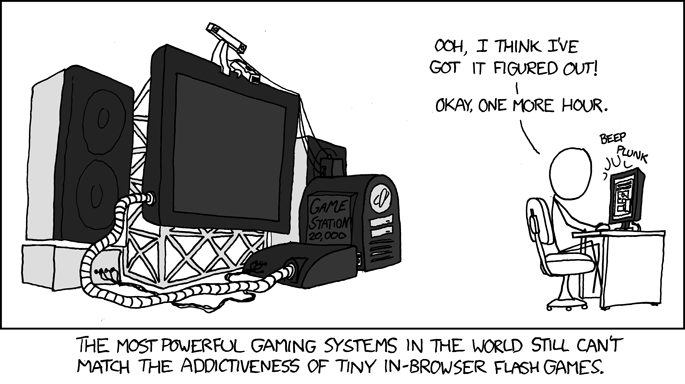 Just as an aside, FLASHISM may broaden its horizons into all types of free gaming and other things flash in general. Animations, randomness … anything related really. Second part of the “Colour my …” games review coming next week. This entry was posted on March 18, 2010 at 10:53 pm and is filed under Random with tags flash games, Ortus, xkcd. You can follow any responses to this entry through the RSS 2.0 feed. You can leave a response, or trackback from your own site.